1. In a medium-sized pot, combine rice with 2 cups of water and bring to a boil. Reduce heat and simmer, covered, 15 minutes. Remove from heat and let sit, covered, until ready to use. Fluff with a fork and season with salt. Garnish with sesame seeds, if using. 2. In a large bowl combine ½ cup soy sauce, 2 Tbsp. sesame oil, rice wine vinegar, 2 tbsp hot sauce, honey, 4 cloves garlic, ginger, and oil in a large bowl. Pour half the sauce into a smaller bowl and set aside. Add flank steak to marinade and let sit 10 minutes. 3. For cucumber salad, whisk together rice wine vinegar, remaining tablespoon soy sauce, remaining tablespoon Sriracha, remaining tablespoon sesame oil, sugar, remaining garlic, and red pepper flakes in a large bowl. Stir in cucumbers and season with salt and pepper. 4. Heat a grill or grill pan over high heat. Season steak with salt and pepper and grill 5 to 6 minutes per side for medium-rare. Transfer to a cutting board and let rest 5 minutes, then slice thinly across the grain. Pour juices into small bowl of remaining sauce, stirring to combine. 5. 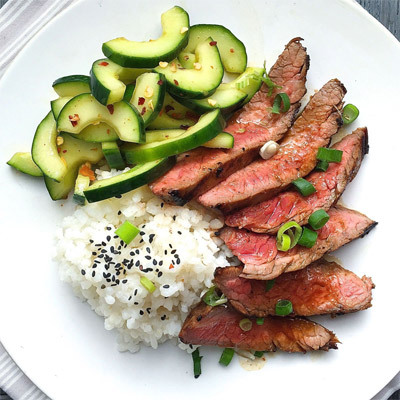 Serve steak drizzled with sauce and garnished with scallions and with sticky rice and cucumber salad.